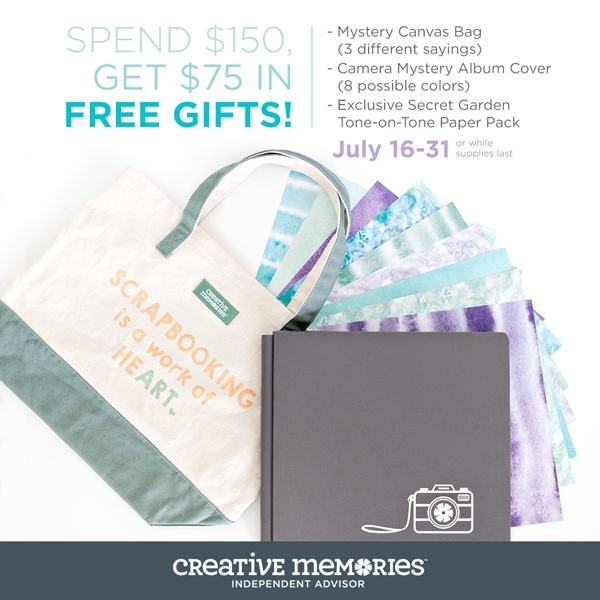 Now through July 31, 2018, when you spend $150 on my Creative Memories website you'll earn a free Mystery Package worth $75.00. Included in the bundle is a Mystery Canvas Tote Bag (the mystery is which of three sayings will be on your bag), a 12" x 12" Mystery Camera Album Cover (the mystery is which of six colors you will receive), and an exclusive Secret Garden Tone-on-Tone Paper Pack that is only available during this promotion. Check out my website to take advantage of this promotion. Hurry, the promotion ends on July 31, 2018 or until supplies last. Have a great week and happy scrappin'!